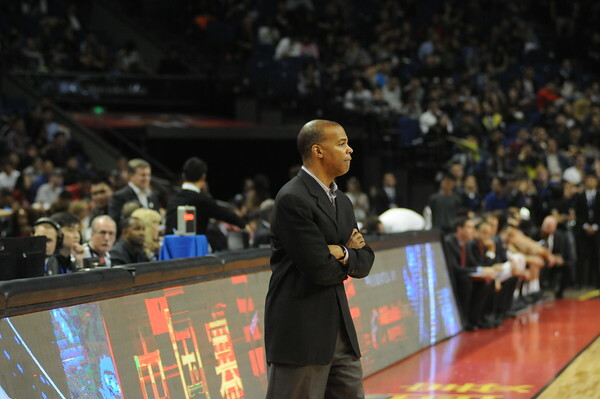 Harvard coach Tommy Amaker, shown here in the team's 2016-2017 season opener against Stanford in Shanghai, became the winningest coach in program history Wednesday night as his team beat Boston College, 74-66. 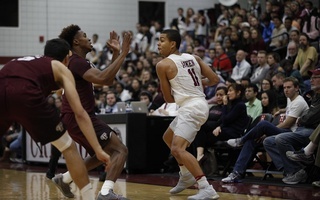 CHESTNUT HILL, Mass.—Harvard coach Tommy Amaker has made plenty of history when his Crimson teams have squared off with Boston College. In 2009, Harvard beat the Eagles in what was the program’s first ever win against a top 25 team. The victory was the first of six straight wins over BC, the longest Crimson run in a series that has featured 50 matchups dating back more than a century. On Wednesday night at Conte Forum, Amaker added another notch on his belt as a 74-66 win over the Eagles gave the 10th-year head coach the most victories in program history with 179. Amaker passed his predecessor, Frank Sullivan, who led Harvard to 178 victories over 16 seasons in Cambridge. Freshman forward Chris Lewis paced the Harvard effort with 22 points and five rebounds as the Crimson (4-4) held off a Jerome Robinson-led BC (4-4) rally in the game’s final minutes. After entering the second half holding a 16-point lead, Harvard kept BC at arm’s length for a majority of the final 20 minutes. Whenever the Eagles hit a shot to cut the lead, the Crimson had an answer on the other end. However, BC’s run-and-gun offense, consistently open looks, and ability to corral offensive rebounds made the double-digit lead never seem safe. 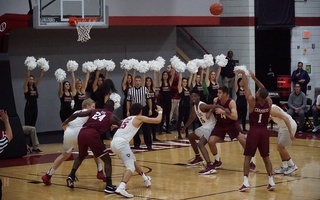 The Eagles had 20 points off of 14 Harvard turnovers and made 11 three-point field goals on the night. The Crimson began settling for shots and the jumpers Harvard’s defense was daring BC to take all night started finding the bottom of the net. Going into the penultimate media timeout, the Crimson lead was down to 11, and then with 5:17 to play, the Eagles were within single digits. Both teams stayed off the scoreboard for over three minutes before Robinson sunk his third triple of the game. After another stop on the defensive end, BC had an opportunity to make it a one possession game, but his three was long. A Justin Bassey layup off of a Siyani Chambers deep pass proved to be the dagger for the hosts. Despite the rocky finish, Harvard had a cushion due to a strong showing in the game’s first 30 minutes. After missing its first two field goal attempts, the Crimson zeroed in in its second game in as many nights. 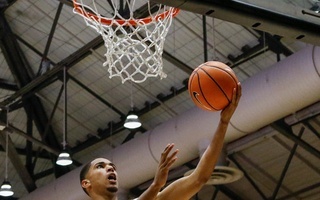 Following freshman Seth Towns knocking down a three to kick off the scoring, Harvard jumped out to an 11-point lead by the game’s second media timeout. 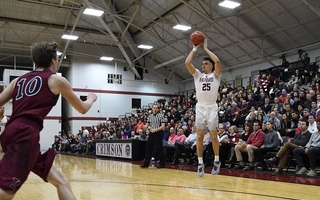 The Crimson posted its second consecutive 46-point half in the first frame on Wednesday while shooting a blistering 57 percent from the field. Lewis, Towns, and classmate Bryce Aiken accounted for 33 of the first half points. Harvard went inside early and often on Wednesday, with 50 of its 74 points coming in the paint or from the charity stripe. The Eagles’ start was marred by turnovers and missed jump shots. The Crimson lead peaked at 18 as Lewis was a menace down low and Towns showed off his versatility, peppering the BC defense with long balls, up-and-unders, turnarounds, and stepbacks. Robinson paced the Eagles’ offense with 25 points on 10-of-23 shooting but it was not enough to push the home team over the top. Chambers posted his third consecutive double-digit assist performance and did not turn the ball over. It was the 73rd win for the on-court personification of Amaker, a fitting performance for a night in which Amaker, per usual, focused on his team and the people who helped him get to win number 179 rather than himself.